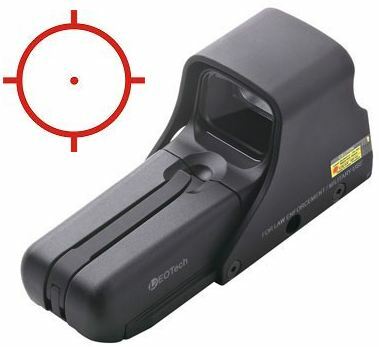 The Eotech 512.A65/1 Holographic Weapon Sight (HWS) is configured with a 1 MoA dot in a 65 MoA ring reticle for fast shooting of moving game, predators and varmints. The 1 MoA dot enables precision out to the range at which the target can be identified. To extend this range by several hundred metres an Eotech G23.FTS 3x magnifier can be mounted behind the HWS. 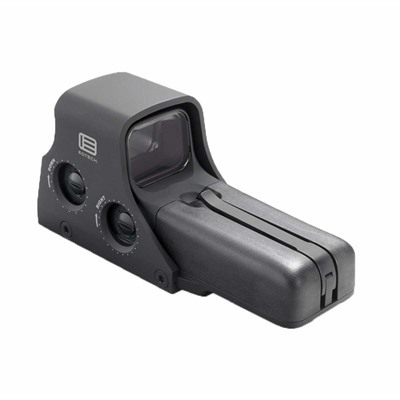 This flips to the side to enable use of this red dot sight at close quarters. Both Eotech and Aimpoint magnifiers can be used interchangealy. Eotech vs Aimpoint there is little difference in quality. 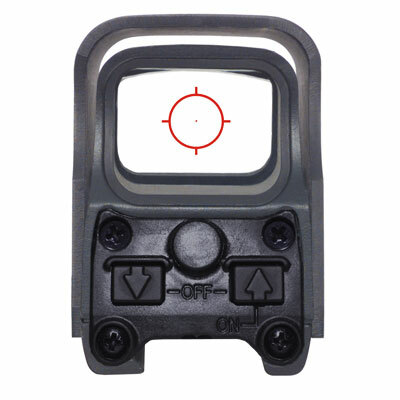 This red dot sight is supplied in a matte black finish. For a Mossy Oak Obsession finish see the Eotech 512.A65MO model. The Eotech 512.A65/1 HWS employs the latest solid-state electronic technology. No less than 20 brightness levels enable this holographic sight to adapt to any lighting conditions. The battery check indicator, up/down brightness scrolling and (programmable) auto shutdown are controlled by an on-board microprocessor. 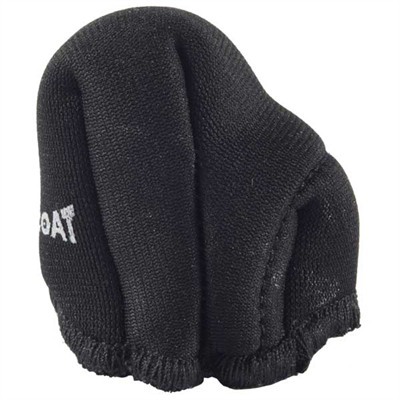 The electronics are protected by encapsulation in a shock absorbing resin compound. The holographic patterns are visible in any light, center instinctively regardless of weapon hold, and remain visible while sweeping the area. Reticles are large and semi transparent to ensure the fastest possible shot without obscuring the target. Red dot vs holographic, the holographic is much less sensitive to head position and cheek weld and allows far more radical shooting positions. The 512 Eotech HWS utilizes a fighter jet style ‘Heads-Up Display’ (HUD) that eliminates the obstructions and restricted angle of vision associated with other types of unitary power sight. The controls do not protrude from the Eotech 512.A65’s streamlined housing and nothing obstructs the view of the target area. You keep both eyes open whilst shooting, ensuring full situation awareness and rapid shooting. Partial obstruction of the window will not prevent aiming. In the unlikely event that the window is shattered the Eotech 512 will remain fully functional! As long as you can see through any portion of the window, the entire aiming pattern will be visible on target and you can shoot accurately. This is as well because Aimpoint vs Eotech 512.A65 the Aimpoint is easier to keep mud and snow out of with its sealing lens caps. A set of lens caps for the Eotech is now available for the Eotech from GG&G, but, due to the Eotech’s configuration these don’t seal in quite the same way. The Eotech 512.A65/1 has been tested in the most extreme conditions and will perform consistently and reliably in any hunting environment. It is proof against water, fog, shock and extremes of temperature. The 512A65 HWS has been subjected to military drop tests and consistently remained operational and held its zero. Other tests utilized a recoil simulator to subject the sight to 3,500 Gs of acceleration in under 0.5 milliseconds (this approximates to mounting on a .454 Casull handgun) as well as chambers simulating various extreme environmental conditions. The Eotech 512.A65/1 does not project any radiation or give off any visible signature that could give away your position or spook game or wildfowl. 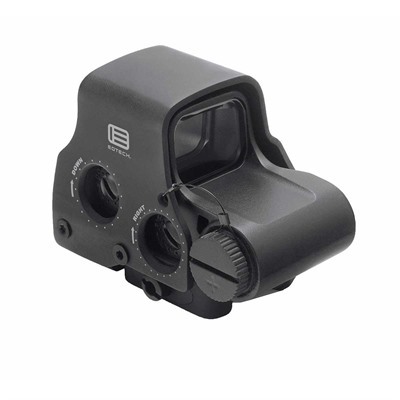 Check the price of the Eotech 512.A65 at Brownells, a name you can trust.